Ah, that does not sound very nice at all. Personally, I wouldn't order from them again. I'm guessing they have a "don't send samples" flag on their system, but not a "send only specific types of samples" flag. Yup, that's it. Here's their email. > these to fit individual customer needs. ^ that used to annoy me, too, but they only give out free stuff if it's close to the sell by date anyway, don't they? It shouldn't be difficult to work out you're vegan by looking at your search preferences and your order, v.annoying. ^That's what I thought. We ordered four blocks of Sheese, one tub of creamy Sheese and two pots of soya yogurt. Surely if you see someone buying that the thought would occur tht maybe they don't eat dairy, but no, they threw two pots of goat's cheese into the same chiller box. I don't buy from goodness direct either - their customer service is appalling. I bought chocolate drops from there and they tasted of mint. I told them and the reply was - no they dont..... idiots - tis a wonder they have a business at all. Oooh I'm glad I looked at this topic, I did not realise redwood foods have an online shop. Nowhere near me sells their gravy and its much nicer than any other vegan gravy! I used to use Abel & Cole but they package stuff in sheep wool and don't think that is a problem for vegans (also their customer service people can be rude and are always really pushy!). I've ordered some vitamins from goodness direct and they were quite quick, although they also gave a free sample of milk chocolate covered popcorn. I didn't know they give samples at all so I was surprised until I saw that it's milk chocolate. I'll give the popcorn to my flatmates..
^ Make sure you tell them that it's not okay for them to send you milk products. I recently ordered some stuff from Goodness Direct and they sent me a nice vegan freebie - I had ticked the vegan option on their site options page https://secure.goodnessdirect.co.uk/...t/options.html, not sure if that helped or whether it was just good luck. or read more here http://www.veganforum.com/forums/sho...lease-support! Veganchic - looks good, will probably order some stuff for Easter. More on Goodness Direct: I ordered some bits and bobs using a code from a facebook ad for £10 off spends over £35. They didn't send me any freebies but I thought that discount was really good. I ordered Thursday evening and it came yesterday. I really cant fault goodness direct. Ive had the odd damaged yogurt or broken pizza base but on a whole no complaints. Ive logged on as vegan so only view and order vegan products. Any freebie ive recieved has also been vegan. Full marks from me! I found this place online a couple weeks ago, its a bit like Goodness Direct (sells meat, dairy, vegan, vegetarian etc) but they have some stuff that you dont get anywhere else (Amy's Burgers, Amy's Rice Macaroni With Dairy Free Cheese, Le Sojami Dairy free cheese, Yakso Organic Seitan, Ready made frozen nut roasts, Tofurkey Feast etc). Thanks, Firestorm. Just had a look. Unfortunately, honey appears to be vegan? Organic Lemon Honey Biscuits turned up in my filtered search, and they have marked them as vegan. Will just pop them a quick email! Yeah, you've got to be so careful sometimes, a couple of months ago I'm sure there was a wrap on Goodness Direct labeled vegan, but it had cheese in it ( I think there was a vegan one with Sheese in and a veggie one with dairy cheese but they had the labeling the wrong around - seems to have been fixed now). Theres a site for a company in Scotland called realfoods and I had to tell them about 5-10 of their products over the weekend (either labeled as vegan when they weren't or were vegan and not labeled) luckily they have an option for each product where you can report inaccurate info. When dealing with non vegan companies I tend to not bother using the filters either, I find they filter out stuff that is vegan and has not been marked properly (Goodness direct does not label all conscious chocolate bars as vegan, but they are). I've noticed that with Goodness Direct. I, too, tend not to use the filters. I think the sites do appreciate a friendly email. It helps their site. Wow!!!! Thanks for the link, I'm off shopping. The basil soft cheese looks good and so does the mac n cheese. Hey. Thought i would mention my store here www.vegan.co.uk . been on the forum a while and have been working on it for a year or two. It's brand new and it's only me MrGreen working on it at the moment. But im working on making it more than just a store. I want a community there, i've got a great news feed and welcome anyone who has any websites or blogs to email me and i'll try to get a mention in the "friends" section. It is just starting up and we only do UK shipping but im hoping to really achieve some great things with the help of all the vegans out there! Ginger Root is good for your youth. "Be healthy - Dead Prez"
I have visited the site a couple of times and was quite impressed, I think you have a couple of things other shops dont tend to have (individual cartons of lima chocolate rice milk?). So give it a few weeks and come again and hopefully the layout will be much friendlier, also still in two minds about what to do with the front page. It is very simple at the moment. perhaps some links to products, or to certain areas of the website. Any advice i would welcome . Alternative Outfitters is my favorite! careful with natto. A lot of the time there's fish in it. I accidentally ate bonito once because of natto. I can't even try the vegan stuff anymore bc of that! Usually that'd be in the sauce packets though, the natto itself is normally plain and then you can put whatever you want on it. i don't remember... it was traumatic, though. We just got an order from Goodness Direct. Good news: They no longer use polystyrene boxes for frozen goods, instead they're using double walled silver painted boxes. Bad news: They thought that we'd enjoy some complimentary goats cheese and milk & vanilla baby cookies...wtf? 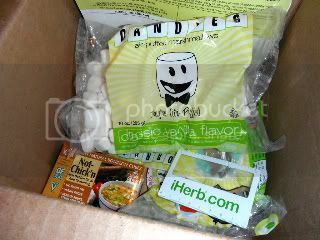 iherb.com does the same - even if you can choose freebies yourself, they always enclose something extra, and sometimes it is not vegan.. However, I keep ordering from them as postage is affordable (starting from $2 for the first pound, $4 for 3 pounds) and some vegan things are much cheaper than in other places. Also, you get $5 discount with your first order (use code CEG631 ). Last edited by Mija; Apr 2nd, 2012 at 05:02 PM. Vegan Emporium is a newish Bristol based online store, who have regular-ish events at Cafe Kino. They're also at one of the upcoming London Vegan Festivals. Lovely gooey mini easter eggs enjoyed. I found this place a while ago (http://www.auravita.com/), but I've just ordered some stuff from them because they have the new Booja Booja collection on sale (£12.40 instead of £14.99), they have quite a few vegan products, some of which are unusual and hard to get hold of (Molenaartje Fruit Break Bars, Organic Food Bars). The funny thing is I ordered 7 items and they might be posting them all individually , I got an email yesterday saying they had dispatched 1 bar Organic food bar but the other 6 items were still pending. Where can I buy Tofurky online? Unless anyone has other suggestions? I preferably want something family size! Re: Where can I buy Tofurky online and ship it to the UK? Here you go (http://www.naturalgrocery.co.uk/Prod...e=025583004634), its £29.99, with free delivery over £30 (£3.5 Charge for ice boxes). Mine arrived on Thursday and I cant wait for Christmas now. Re: Where can I buy Tofurky online? It'd be waaaay cheaper to make your own. I make the Tofu Roast from Sarah Kramer's La Dolce Vegan. It always comes out well and makes loads. I have an online shop!! Everything on here is vegan and not tested on animals. It is mainly make-up and toiletries, we also have some Naturtint hair dyes in too! We put all manufacturer credentials next to the products so you know you can trust what you are buying. If anyone's doing a first time order on iHerb, you can use the voucher code QEH834 to get $5 off. International shipping rates are good and they do loads of unusual American vegan stuff, like Dandies marshmallows, Crazy Rumours lipbalm and Peanut Butter & Co white chocolate peanut butter. The website is a bit difficult to navigate and you have to know what you're searching for but it has alot of good stuff. Thanks Blueberries - I just ordered some great stuff, has yours arrived yet? i'll second that thanks! i ordered some powdered peanut butter. really intrigued to try it. Thanks Firestorm and Veganosie . My stuff hasn't arrived yet, I ordered last Monday so I'm hoping it'll arrive tomorrow or Tuesday. Can't wait! oh blueberries i am so jealous!!! i hope mine comes soon, but what did come today was a bag of freeze-dried strawberries from healthysupplies.co.uk, and a pair of vegan winter boots from alternativestores.com! it felt like christmas all over again. Hi I'm new to this forum. But have been a vegan for a long time. Mooshoes has a brilliant selection of shoes, they're based in New York, and when I was there I bought some lovely sandals I couldn't get anywhere else. I wish I had stocked up more while I was there. Definitely worth a visit if you're in New York! Has anyone mentioned Feelgoodhandbags http://www.feelgoodhandbags.co.uk/? They sell lovely vegan bags, wallets and purses. I love the Espe range. Also Matt & Nat, http://mattandnat.com their stuff is gorgeous but not for the poor of pocket! Vegan Society and BUAV approved.